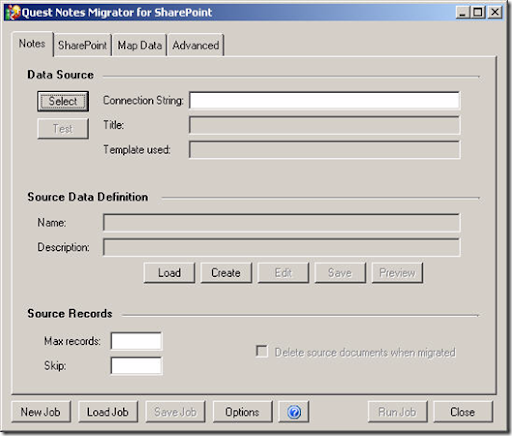 This article discuss about Lotus Notes Migration approach and How to do Notes application data migration to SharePoint using Quest Notes to SharePoint Migrator tool. 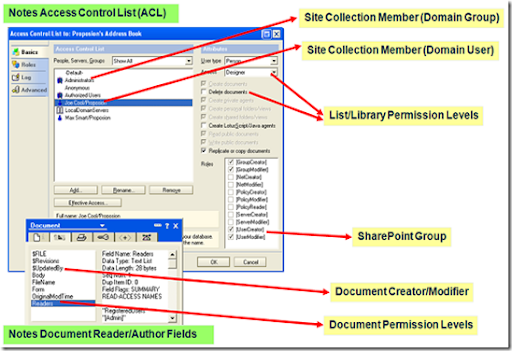 Study and Understand SharePoint Site layout, List, Document Library and Site Collection user permission. 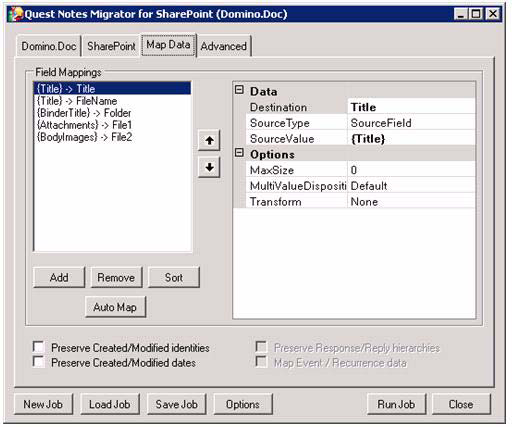 Identify destination SharePoint data source and do mapping. Phase wise roll out roadmap of migration by business criticality, users etc. 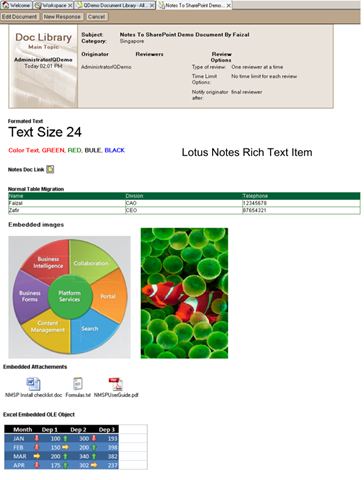 Lotus notes to SharePoint migration there are more than 10 tools available in the market (i.e. Quest, Unify, Transporter and DocAve). 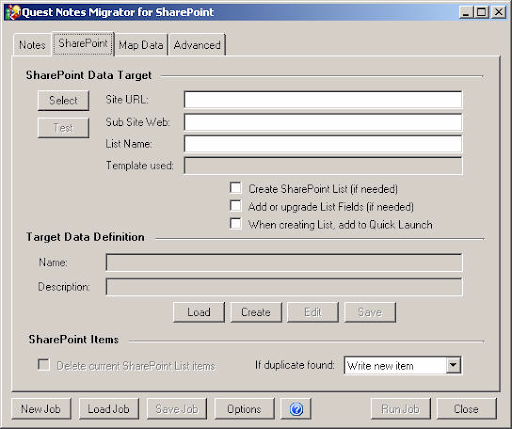 This article mainly focus on how to use Quest Notes Migrator for SharePoint 5.0 tool to migrate Notes data to SharePoint. 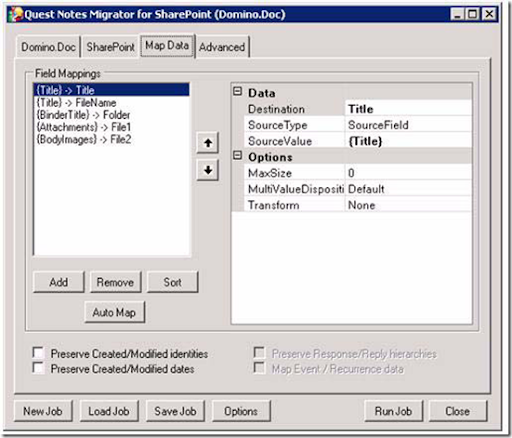 Notes Migrator for SharePoint includes a powerful facility for reading local Notes databases and remote Domino databases. 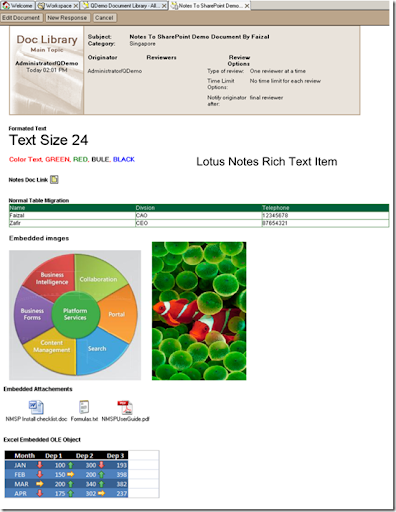 This software's data query engine extract document items, view column values, attachments, embedded images, embedded OLE objects, rich text, DocLinks, multi-valued items, unread marks and dynamically computed fields values from Lotus Notes and writing the results to SharePoint Lists, Notes Migrator for SharePoint products supports all standard List Types (such as Document Library, Discussion, and Events) as well as rich text and attachments. Notes Migrator for SharePoint also supports migrating document library files and can preserve Reply-To hierarchies in threaded discussions. It also includes support for advanced SharePoint features such as document level security, versioning, folder support, duplicate document handling, content types and document approval. Notes Migrator for SharePoint migrates content from standard template-based Notes applications, highly customized Notes applications into SharePoint. 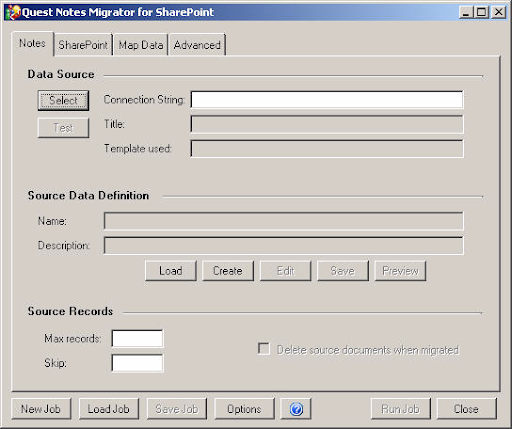 With an intuitive user interface helps Notes / SharePoint developer to easy-to-follow and mapping of Notes data sources to SharePoint list destinations, Notes Migrator for SharePoint can be operated by Notes / SharePoint developers. After a successful migration, your organization’s original Notes information is available for use on the SharePoint platform. 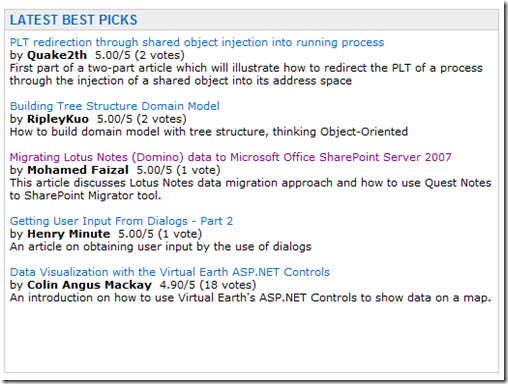 Below example demonstrate how successfully migrated following notes elements to SharePoint. 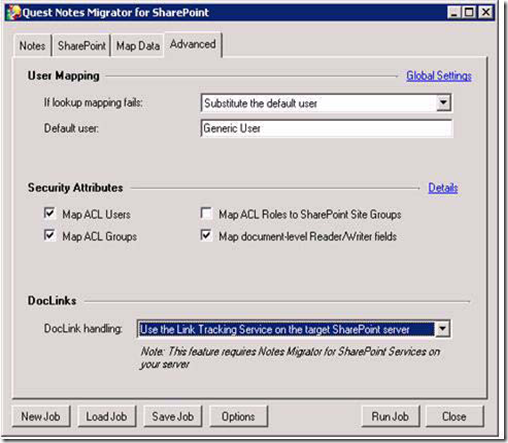 Notes Migrator for SharePoint 's security mapping options will map various access control properties of the source Notes database. 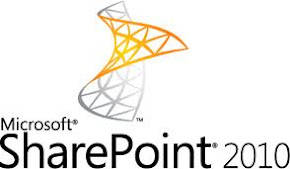 An extensive set of options are available for mapping various access control properties of the source Notes database and individual Notes documents to the equivalent security constructs in SharePoint. The following diagram summarizes the possible security mapping options available to you. Security mapping options allow translation of Notes access control rules to SharePoint. 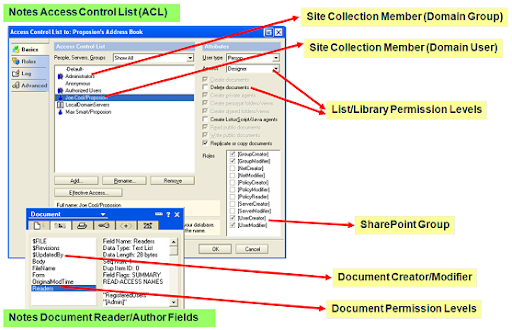 The Map ACL Users option will cause any Notes users listed in the source database's Access Control List to be added to the target SharePoint list or library. 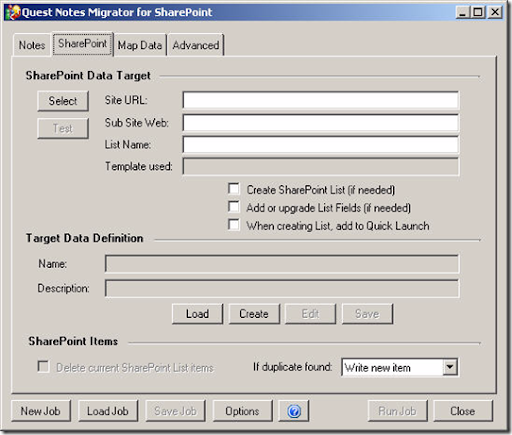 The Notes user names are mapped to Site Collection identities based on the rules configured in the tool's User Mapping Options and those Users are granted access to the target SharePoint list or library. 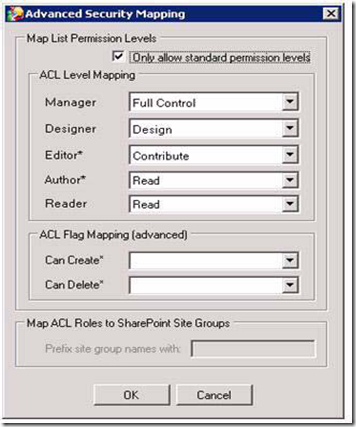 The Map ACL Groups option will cause any Notes groups listed in the source database's Access Control List to be added to the target SharePoint list or library. The Notes group names are added to the Site Collection as external groups and are granted access to the target SharePoint list or library. Each group name must correspond to an actual Domain group. 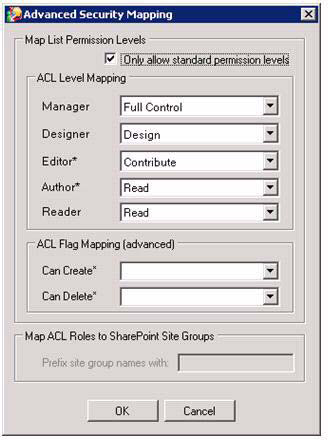 The Map ACL Roles to SharePoint Site Groups option causes a new SharePoint Site Collection Group to be created for each Role defined in the Notes database ACL. If the Map document-level Reader/Writer fields option is set, then any Reader Names or Author Names items encountered in a particular Notes document will cause a permission list to be generated on the corresponding SharePoint record. This new permission list will only grant read access to the users and groups named in the Reader Names field and will only grant edit access to the users and groups named in the Author Names field. 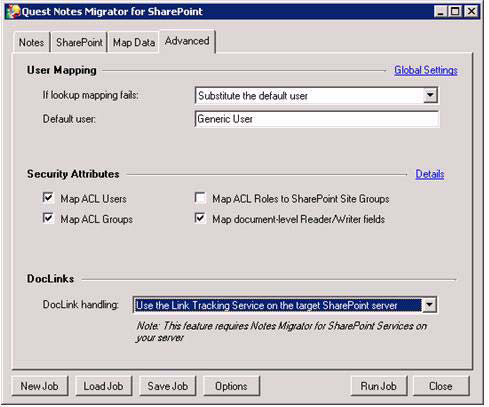 Above solution covers all aspect of Notes to SharePoint Migration I am sure that this will accelerates migration timeline and impact very minimal to your existing environment. In 2008 world face financial tribulation and the biggest financial companies brought to their knees. 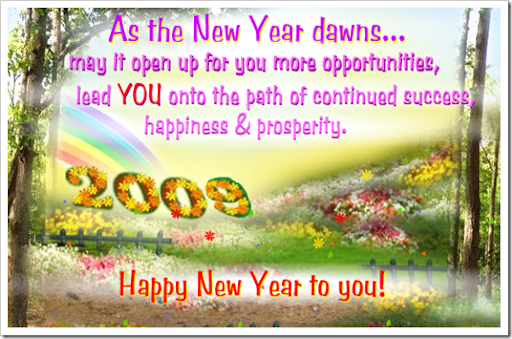 Personally I just turn back re-call my memory what we achieved in 2008, Surprisingly yes, it is another good year in my life. In October 2008 I was promoted to next grade and learn new skills in area like proposal management, Risk management and improved my presentation and communication skills. In terms of social computing actively participated and contributed 68 post via "Come Across" blog, contributed 22 blog post via படியுங்கள்! சுவையுங்கள்!! (Tamil) blog and also wrote 4 article on www.codeproject.com titles given below. In terms of financial I also book some loss, but its lead me learn about Technical Analysis skills, good financial lessons. 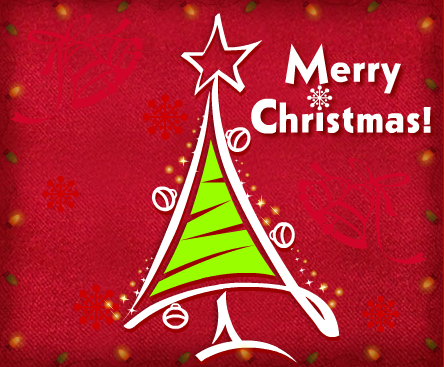 Big thanks to magazine like www.moneytoday.in, www.vikatan.com (Tamil), and Mr.Sai blog. 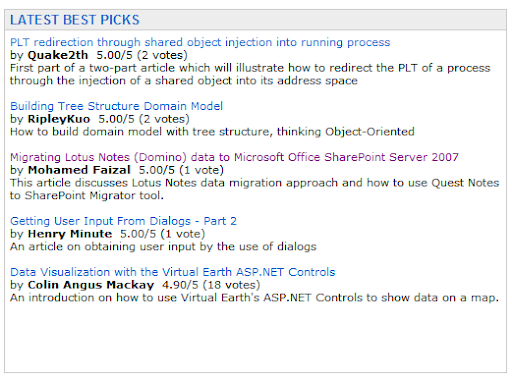 I am very happy to know that my Migrating Lotus Notes (Domino) data to Microsoft Office SharePoint Server 2007 article has been listed under latest best picks area. Quest going to release 5.0.1 patch for Notes Migrator around Q1 or Q2 2009. When its release we can expect following features. DocAve Lotus Notes Migrator provides a reliable, efficient and cost-effective solution for the transfer of documents and application content from Lotus Notes/QuickPlace/Quickr to SharePoint 2007. DocAve lets SharePoint administrators easily automate the process of consolidating legacy Lotus Notes/QuickPlace/Quickr into SharePoint with minimal impact on end-users. This article discuss about understanding the different type of SharePoint server farm topologies. The SharePoint Server 2007 server farm design vary based on the customer requirements, security perspective and size requirement. The topology designs can be created based on the size of the server farm namely small, medium, and large which can focus on either a single or multiple farm models. Web Front End Server : A front-end server that provides the web services used to render applications (Presentation layer). SQL Database Server : A dedicated server running either Microsoft SQL Server 2005. In large farms, this is typically a SQL Server clustered configuration with two or more servers. 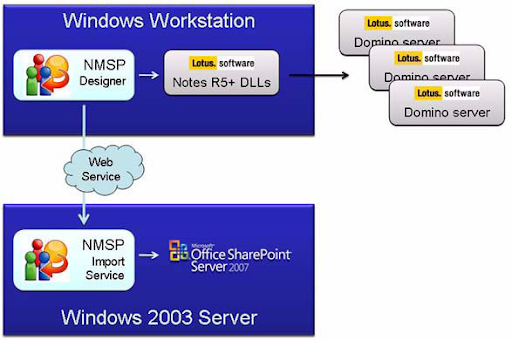 Domain controller : Provide authorization and authentication service to Office SharePoint users. Small server farm which consist of two-server, one of the servers hosts the Web front end and the application services, while the second server hosts the SQL Server database. This provides a way to manage the database separately but adds complexity without adding scalability or availability. This type of smallest deployment that is recommended for demonstration, training environment or very small organization or user group. If you notice that architecture diagram has domain controller, either demonstration environment or very small group, I am sure that there will be existing domain controller server, you may consider re-use. Part of this article is to help you determine the minimum requirements which allow you design and achieve your customer goal. To design high-availability solution, you must deploy a server farm. To decide you may need to discuss following items with your customer and analysis the outcome. Is your overall availability requirement below 99%? Is the availability of your data critical? Question 1 Is your availability requirement 99% or greater? If your customer response to “YES”, which means organization looking for high availability on Office SharePoint Server 2007. I order to meet above requirement you need to design your Web Front End Server to the two-server deployment, which will gain scalability and availability by load-balancing requests so that if one server goes down, the system up and running. Question 2 Is the availability of your data critical?, If your customer response to “YES”, which means organization is looking for high availability and gain scalability to safe from data loss, so your design need to be clustered or mirrored database server . To design enterprise-level SharePoint environment, you may need to discuss following point with your customer and analysis the outcome (This question are in-addition to medium farm server questions). The above architecture diagram shows Web Tier, Application Tier and DB Tier which design to serve different purposes, each of the servers provides specific SharePoint Server 2007 services such as Index Services or Excel Calculation Services, and the front-end servers provide web content services. The servers in server farm (WFE server, Application server, Index server) must run with Office SharePoint Server 2007. Database server which configure clustered or mirrored environment with SAN storages. There is nothing special or difficult on above architect design, basically understanding the customer requirements (i.e. future user growth rate, storage capacity, system availability, security, and system performance requirements) put this pieces of information together and analysis and provide possible solutions architecture that meet your customer goal. Light dinner will be served before session. Light up your SharePoint site with Silverlight 2.0, the latest release for rich internet application framework. You may already see Silverlight enabled site for ASP.NET applications, but how do you do it in SharePoint? This session will explore the configuration needed to make MOSS Silverlight enabled. Some demos on video streaming, image composition and rich UI experiences will be presented. Choirul Amri is Co-founder of IlmuKomputer.Com, the largest e-learning portal in Indonesia. He was also the founder of SQL Server User Group in Indonesia (sqlserver-indo@yahoogroups.com) a PASS Chapter and Culminis member. His interests are ASP.NET, SQL Server, and Enterprise Resources Planning. He started IT career as a Network Administrator, then move to various roles as DBA, developer, and trainer. To register, please send your name, email, contact and company name to ssofian@mvps.org. Please help to forward this email to someone whom you think is interested to get involved in the user group. Thanks. 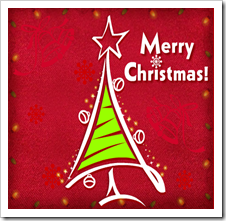 To kick star SharePoint development, Developer may be require following software. This policy document outlines the items and processes for managing customization within an enterprise Microsoft® SharePoint® Products and Technologies hosting environment. This document is useful for SharePoint developer, because a complete list of built in out of the box web services URL's listed in table format.